Last night, my brother, Fleetwood and I went to see “Singing in the Rain” at the AMC Theater at NorthPark Mall. Sounds like good clean fun, right? Our night ended as we were kicked out of the parking lot by a brigade of 3 mall cops, driving go-carts accompanied by car that looked something like a 1977 Gremlin. They told us we needed to leave before the police arrived if we wanted to avoid jail time. Well, obviously for talking in my car on a cold night after seeing the movie. According to these mall cops, this is known as LOITERING. And it’s a pretty serious crime. Because the movie ended a little after 9pm my brother walked me to my car in the parking garage. Then, I drove him to his car in a different outside parking lot. During that little walk and short drive, we started having a great conversation. The kind of conversation that you end up sitting in the car for longer than expected because it's so great. Until you’re surrounded by mall cops with flashlights pointing in your faces. As my brother and I had been talking, out of the corner of my eye, I kept seeing yellow lights slowly drive past us. I didn’t think anything of it, because there were lots of cars in the parking lot, and drivers seemed to be coming and going while we sat and talked. But then, after about 25 minutes, I heard a little tap on my driver’s side window. It startled me, and then startled even me more when I saw a young man in some police-looking uniform with a flashlight. I opened my door and he asked us what we were doing. So I told him. 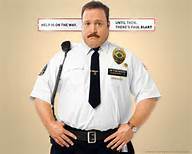 With his mall cop authority, he told me we needed to move along, as Northpark Mall has a “strict policy about loitering.” Were we loitering? Really? I would like to add a little of the backstory here. My brother is one of my favorite people. He's my biggest cheerleader, and I am his. Since we met at a movie, we hadn’t yet had a chance to catch up at all, so we got to talking in the car. I've been struggling a little lately, and he was coaching me through some things, and it was a very meaningful conversation. We told the mall cop we’d leave as soon as we finished our conversation. We weren't doing anything wrong, and I would hardly call what we were doing loitering. But within about 5 minutes, I saw his little go cart drive up to my car again. This time, he gave me a warning: Go NOW, or the Dallas Police will be called. Fleetwood told him that if he wanted to call them, that was okay. But we were going to finish our conversation. There were still lots of cars in the parking lot and it wasn’t even 10pm yet. I guess my brother’s response really fired this guy up, because within a few minutes, we saw 3 go-carts pulling up and surrounding my car. There was also the Gremlin looking car with flashlights on the top, making it look like it might be the head mall cop. This man, Parker, shined his flashlight in my face, and as I rolled down my window, he asked me with his country accent what we were doing. So, we explained again. And he told us that we needed to leave before the cops arrived, warning us that they had "already called 'em", and that we were “probably going to jail.” For some reason, he also felt the need to tell us he was a retired police officer. Somehow, I doubt it. At this point, Fleetwood and I had actually wrapped up our conversation and were ready to leave anyway, but it sorta became a battle of the wills. This threat of going to jail was a little too enticing to leave the scene of the crime. I would love to know how a real police officer would react to this whole situation. But my brother took the high road, and just made a joke saying, “Ok Parker, I’m getting out of the car and walking to my truck. Please don’t shoot.” And the mall cop said in a very gross tone (sounding like one of those backwoods bad cops you've seen in movies before) “Well, I don’t have a gun.” And I swear, he said it as if he was implying that if he DID have a gun, he might use it. Hmmm. First of all, we were inside my car. Secondly, once the first mall cop asked us what we were doing, he knew our purpose. We were finishing up an important conversation. He should have left us alone. My brother looked up Northpark Mall’s “strict loitering policy” which basically said overnight parking or camping is not allowed. So we weren't loitering by any standards. We were just being harassed. By mall cops. This is all so stupid it's funny, but its also is enraging. Fleetwood and I are both enraged that these guys are so bored, and so pathetic that they have to harass us for talking in my car. Enraged that they would even consider wasting the time of a Dallas Police Officer to intervene. And enraged that rather than patrolling a parking lot to make sure NorthPark customers are safe, they’re instead gathering up all of their staff to gang up on a brother and sister who are just talking. It's guys like these that make such a joke out of mall cops. I just read this again and still can't believe it!